I’ve never been a plotter. I’m too impatient. In writing jargon, I’m known as a “pantser,” someone who writes by the seat of their pants. Once I get the general idea of a story with a compelling conflict and a notion of my cast of players, I can’t wait to “discover” the story as I write. It plays out in my head like a movie, but I’m constantly exploring new ways to get organized so my daily word count goals can be achieved without roadblocks. As a compromise between “winging it” and plotting, I submit my latest thoughts on the 3-Act Structure and the Storyboard method of plotting. These are purely my thoughts on combining these concepts as they might apply to my writing, but maybe you’ll see elements you like in this for you. 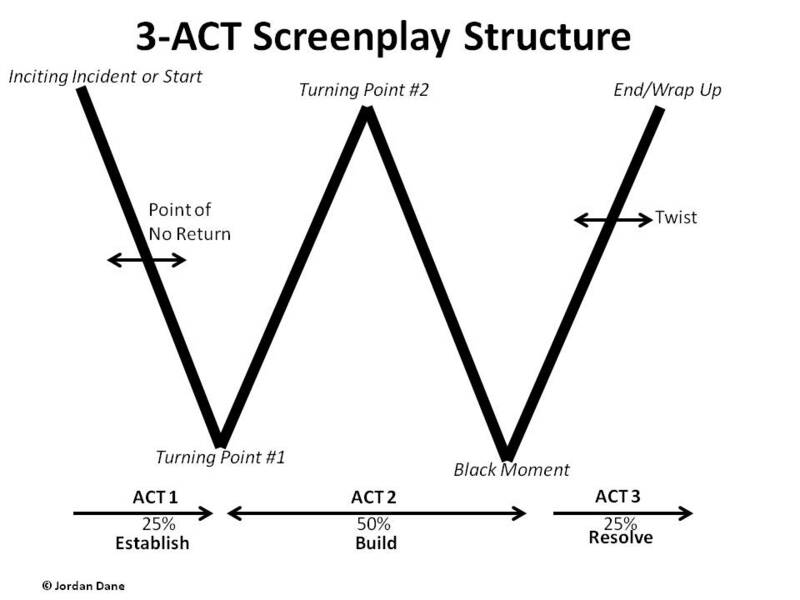 I used to think of the 3-Act Structure as beginning, middle, and end, but I’ve read it more accurately reflected as Establish, Build, & Resolve by Michael Hauge in his book “Writing Screenplays that Sell.” Thinking of these acts in this manner denotes movement. So imagine these three segments as buckets, but before I can toss wads of paper (or scenes) into these buckets, I must have a place to start. Set aside your buckets for now and grab a paper and pen—or sticky notes, colors optional. These 25 things won’t be put into any order. I merely list them as they occur to me, completely at random. I would brainstorm without censoring my thoughts. I heard an author talk about creating notes on post-its so they’re moveable, rather than a random list, but you get the idea. I don’t expect to know every scene in my book at this stage. The storyboard I create will be an evolving beast that I will change as I write, edit, and final my book so I can see my plot at a glance on something visual. ACT I – Establish – The start of Act I (or the top left of my “W”) is the Triggering Event. It’s the inciting incident that will start my story, the point at which my main character’s life changes forever. As I travel down the left side of my “W,” I head for the first Turning Point that usually sets up the problem or the first low point or perhaps a moment of hope. This is a reversal point that changes the direction of my plot as I head out of Act 1. I’ve “Established” my world up to this point and the general conflicts and players in the first 25% of my book, in theory. ACT II – Build – As my plot heads toward the upward middle of my “W,” that is another key reversal. If I have a book with hope in my first turning point, this shift might dash those hopes to some degree. If I have a dark moment in that first turning point, things get worse, but the plot takes another key turn one way or the other as the action “Builds.” Act II ends with the next turning point (the 2nd low point of my “W”). This is the black moment where all seems lost. This part of the “W” represents the middle part of the structure or 50% of my story, the “building” middle. ACT III – Resolve – Now I would be in Act III, the last upward line of the “W” after the black moment. I’m headed toward resolution. In this section, my hero or heroine might discover something about the villain in the story that is his or her weakness. He or she implements a plan to take advantage of this Achilles Heel, but I might consider throwing in another epiphany or twist before the end. This could be a twist or complication—an “Oh my, God” moment the reader might not see coming before the world is restored or the ending happens. This last part of the structure is the final 25%. I’ve oversimplified these blended theories for the sake of this article. The lines of the “W” don’t have to be linear, for example. I could have little ups and downs along the way that will take me through my book, but I wanted you to have a general idea of how this could work. Now get ready with your buckets. Each of these 3-acts is a bucket, for the purposes of this explanation. So the list I created at the beginning—the 20-25 brainstormed scenes—each has a place in an Act Bucket. I would add to these 25 things as I get more familiar with my book, but if I were to Storyboard this out, I would create 20 squares that represent chapters in my books. (You might write differently, so make this work for you with your average number of chapters in a single-title book.) I would write my 25 items down with each one written on a post-it note and place them on my storyboard where I think they will go in Act I (25%), II (50%), or III (25%). Since each of these scene ideas is moveable, I can change the order and chapter they might appear to intensify the pace or escalate the tension. Once I see things on my storyboard in a visual manner, I will no doubt want to add more post-it scenes to fill out the detail and transitions in my story as the plot develops. I generally have 4-5 scenes in a chapter. So as my story plot movement gets established and building toward a resolution, I can add colored post-its to signify point of view (POV) switches or character story arcs or relationship arcs to deepen my story understanding. I thought this process might fit my “pantser” approach to structure with a simple method that I can see visually as I write and evolve the story. How does my story begin? Is there a point of no return for the hero to commit? What’s the first turning point? What’s the next turning point that ramps up the stakes? What is the dark moment where all seems lost? Is there a twist before the end? Anyone have a cocktail napkin? I feel a bestseller coming on.